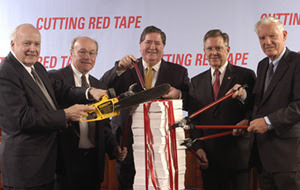 In his column today, Paul Krugman reminds us of the press event in 2003 where "officials from multiple agencies used pruning shears and chainsaws to chop up stacks of banking regulations." This sounds so outrageous in light of the current state of the financial markets that it's hard to believe the story is true. But it is. And just in case anyone thinks Krugman is making the story up to pin the blame on the Bush administration, I have the picture. Luckily, I saw it in a story way back in 2003 and thought it worth saving to my computer, due to the extreme irony of regulators destroying regulations. I used it as one of the pictures rotating on my screensaver for a while (back when that was cool), but no one else thought it was funny. Here it is: What once was ironic is now sad. Roger Lowenstein, author of the excellent When Genius Failed: The Rise and Fall of Long-Term Capital Management, has a puzzling article in the The New York Times Magazine. Broadly, Lowenstein argues that the Fed has been intervening too much in the financial markets: "Government interventions always bring disruptions, but when Washington meddles in financial markets, the potential for the sort of distortion that obscures proper incentives is especially large, due to our markets’ complexities." This argument may well be right, and it may be wrong; it's impossible to know ahead of time exactly how a specific intervention -- especially in times of market panic -- will affect the long-run incentives of banks and securities firms. Lowenstein singles out for criticism the degree to which the Fed intervened to bail out Bear Stearns, arguing that it "interrupted the cycle of boom, bust and renewal that leads to a durable recovery." But what's puzzling is that he thinks the Bear bailout sets a bad precedent because "the borders of finance are...nebulous," and that "[h]owever pure of motive, Bernanke & Co. are underwriting overleveraged markets whose linkages, even today, are dimly understood." The Bear Stearns bailout was necessary precisely because the linkages of the financial markets are so poorly understood, and the borders of finance are so nebulous. We know that global financial markets are more interconnected today than ever before -- what Richard Bookstaber termed "tight coupling" in his excellent book A Demon of Our Own Design: Markets, Hedge Funds, and the Perils of Financial Innovation -- but we don't know exactly where all the connections are. Lowenstein is right that this makes the borders of finance more nebulous, but he doesn't seem to realize that this also makes the borders of financial catastrophe more nebulous. Bear Stearns's collapse could have had ripple effects way beyond anything we would consider a normal economic "cycle of boom, bust and renewal." Lowenstein says that if the Fed had let Bear fail, then "perhaps, after some bad weeks or months, Wall Street would have recovered." But the simple fact that Wall Street might not have recovered, and the collapse of one relatively small bank might have caused a global financial meltdown, required that the Fed intervene. Lowenstein is confusing deleveraging with systemic failure, and recessions with depressions. Deleveraging and recessions can sometimes be cleansing to an economy. Systemic failure and depressions do not involve "cleansing," but rather vicious cycles of self-destruction. Deleveraging and recessions are part of a normal economic cycle. Systemic failure and depressions are not.